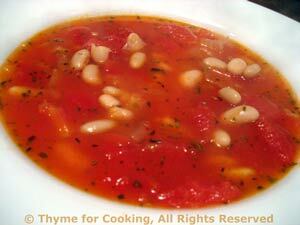 Tomato Cannellini Soup, Thyme for Cooking healthy gourmet recipes. Another pantry soup: easily put together from staples. Using whole tomatoes gives the soup a fresher taste - like summer in a bowl. Roughly chop onion and mince garlic. Sauté in oil until tender. Add tomatoes, juices, beans, stock and herbs to onions.